We've Got Your First Look Inside Mr Bengel! Get excited peeps, because the team behind Gold Coast institutions, Justin Lane and Harry’s Steak Bistro, are opening a cool-as-hell cafe this coming Monday and we’ve got your first look inside! Palm Beach has been happily basking in the sunshine over the past six months, having morphed into the Coast’s hottest spot for new cafe and restaurant openings. Staggering really. So, it was only a matter of time that hospo heavyweight, Adam Haralampou and his team made the move south across the bridge. And boy, we’re stoked they did. May we introduce to you, Mr Bengel! And who exactly IS Mr Bengel, you might ask? Adam always likes to attach a pseudo personality to his ventures, and your new bestie, Mr Bengel is that salty middle-aged surfer who seems to know everyone he passes in the local streets, and never wipes the infectious smile off his creased-by-the-sun face. While your cool uncle-like character won’t literally be behind the counter pouring your coffee, he’s there metaphorically—if you get the drift? Taking over the space recently vacated by Feather and Docks, the team have totally revamped and reconfigured the interiors and given the exterior a slick navy blue and white facelift. You can’t help but rubber neck as you drive past, the clean colour palette is a beacon in this laidback coastal suburb. If it were ever possible to bottle up the energetic, friendly and beachy vibe that’s synonymous with this end of the Coast, we take our hats off, because they’ve absolutely nailed it. 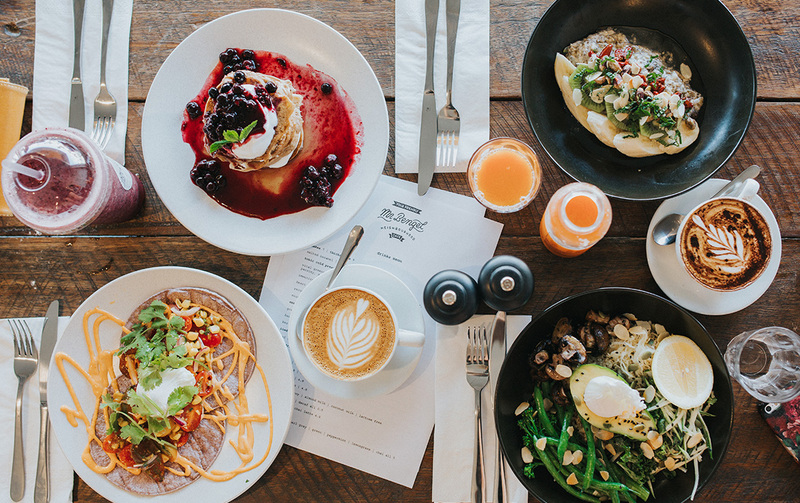 Supreme Roasters coffee (a fave of Feather And Docks’ loyal clientele), healthy shakes, brekkie classics and plenty of creative choices… Judging by the menu, this newbie already knows the tastes of its beach-combing neighbours pretty well. We had a pre-opening sneak peek and gosh are we stoked this vibrant addition is in our hood! We ate our way through fresh and nourishing dishes like a green bowl that was loaded with mushrooms, sautéed broccolini, thin zucchini strips, sauerkraut, poachies, and avo on a light quinoa base. There was a simple but satisfying housemade bircher with seasonal fruit and bush honey, and flavour-packed breakfast tortillas with corn salsa, coriander, and poached eggs. Not usually a fan of sweet stuff for breakfast, the buckwheat banana pancakes with berry compote, coconut yoghurt and maple syrup were perfectly balanced and oh-so Insta-worthy. Drool. They’ve lived up to their promise of reasonable prices too, with most dishes averaging around $15 to $16. Prospective home buyers will be pleased to see the miso smashed avo on sourdough is a very affordable 12 bucks. Having two other venues of the late-night variety, Adam has a great business model, as he can now give extra day-time hours to his staff from Justin Lane and Harry’s, who’ve otherwise had to find second jobs in the past. It ensures the same culture, vibe, and familiar faces you know and love from his Burleigh venues will carry across to Mr Bengel. He’s also achieving another honourable business goal, by giving some of his loyal team members a chance to realise their dreams and take a step up in the industry. A previous staffer, Mr Bengel manager’s Justine Tompsett is also part owner and will be the regular face of the cafe. And if you need any more reason to swing by and test the goods on opening week, Mr Bengel will be pouring FREE coffee (yep, FREE COFFEE peeps!) from Monday, March 6 through to Friday, March 10, between the hours of 6am and 9am. Soon open for brekkie, lunch, and awesome coffee (did we say that already? ), you’d best be making plans to drop by and say howdy to your new local and the crew, stat. Before we sign out, can we just take a moment to celebrate the fact the Gold Coast breakfast scene is off the hook?